Dental implants bring back functionality to your teeth and jaw, and aesthetically restore your smile. They can be used to replace any number of missing teeth, while reinforcing the integrity of the bone and bringing your oral health and everyday life back to normal. Be it one tooth, or a full upper or lower jaw of teeth, dental implants provide you the opportunity to get your smile back—and to get it back in full, natural-looking and working order. Even if you think of the prosthetic (or “crown”) first when you think of dental implants, the implant is actually the replacement tooth root. Implants provide a strong foundation for the fixed (i.e., permanent) or removable replacement teeth that are created to match your original teeth. After being inserted into the jawbone, osseointegration begins—or the process where the metal roots fuse with the natural bone in your jaw to create a permanent home for your implant. This process will take approximately four months. Not only will the implant and custom crown return you to your natural habits of chewing and speaking, but they also allow your jaw and muscles to return to their original state as well. This means the shape of your face will be unaffected by missing teeth. 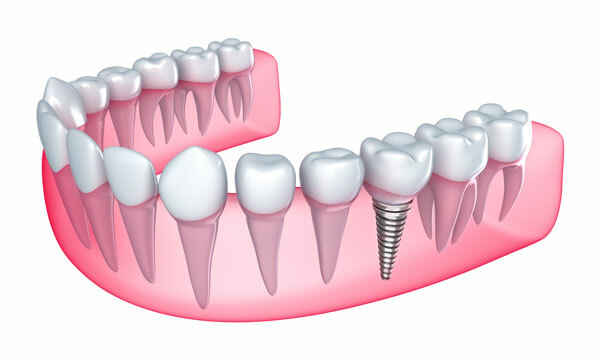 The process also helps all your remaining natural teeth, because they are given extra stability from the implants, which prevents their movement and the breakdown of the bone’s integrity. This promotes a natural level of jaw health, and prolongs your overall oral health—even if at one point it felt lost forever. The success rates of dental implants vary, depending on where in the jaw the titanium implant is fused. However, dental implants as a whole have a success rate of over 98%. With proper care, implants can last a lifetime—exactly like a well-cared-for natural tooth. Dr. Ku will walk you through your options and what you can expect in a dental implant procedure. With new surgical advances, what use to be a procedure with two visits under the knife is now a simple surgical procedure followed by a quick visit. Full upper or lower jaw:Full prostheses, or dentures, can be placed with the same procedure as other dental implants. You can also have non-permanent dentures anchored onto shorter metal rods, which require a similar surgical procedure. Improved appearance:Dental implants are put in permanently and fused with the jawbone to make your mouth feel normal and comfortable again. They renew your confidence, knowing that you have a full, healthy smile—and they also prevent the shifting of other teeth, and the effect of missing teeth on the shape of your face. Ease of eating:Since dental implants feel like the natural teeth they replace, eating without pain becomes a welcome adjustment. Durable:With proper care, most patients’ implants last a lifetime. Convenience!Dentures need to be removed and cleaned, and require adhesives to stay in, and sometimes come out unexpectedly. Implants remove all of these pitfalls. Improved speech:Dentures can slip and crowd the mouth, making speech more difficult. Implants will return the mouth to the regular state that provides the ability to speak clearly and comfortably. Improved oral hygiene:Dental implants don’t interfere with other teeth the way other tooth replacements do. For example: bridges affect other teeth over time by promoting food traps and decay. Implants, on the other hand, don’t need to reduce or disrupt teeth around them, keeping them full and intact and healthy. Patients who are in good oral and general health are the best candidates for dental implants. The bone in your jaw needs to be capable of supporting the implant, also, and healthy gum tissues with no sign of periodontal disease is imperative. The planning of the overall procedure will be conducted through the extensive teamwork in our Fort Worth Dentist office. The special knowledge, training, and technology that our office is equipped with helps us prepare for these procedures. Feel free to call and discuss the dental implant options available today. The good news is that dental implants can be a permanent solution for missing teeth, especially if you take good care of them. But, what does that mean? Dental implants are cleaned and cared for exactly like a natural tooth. As long as you practice your best oral hygiene, and come in for your regular visits at our Fort Worth office, they’ll serve you as long as well-cared-for natural teeth!